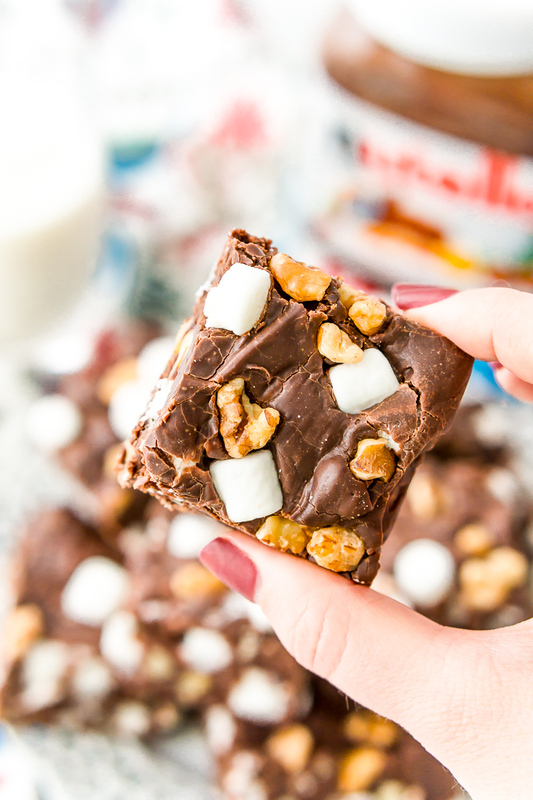 Nutella Rocky Road Fudge is perfect for Nutella and fudge lovers, alike! Loaded with marshmallows, walnuts, and chocolate chips, it’s an easy and delicious treat that everyone will love. 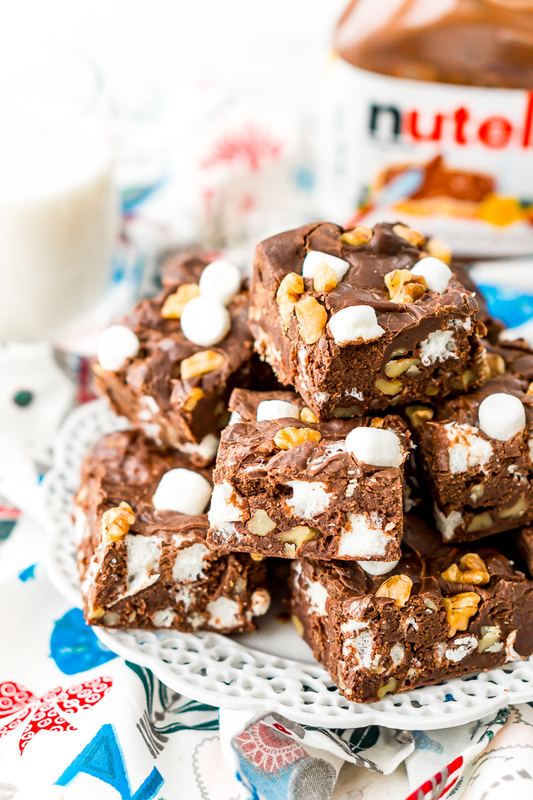 Nutella Rocky Road Fudge is the must-have treat for chocolate and Nutella lovers this season. You may already know that I enjoy incorporating Nutella into goodies like hot chocolate, frosting, and no-bake cookies. So if you’re crazy about the hazelnut spread, you have to try this recipe! 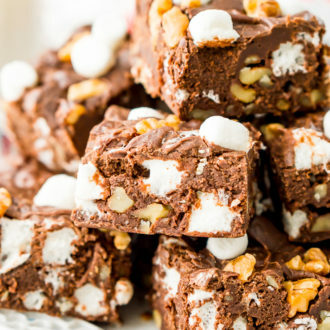 Rocky Road Fudge is smooth, rich, and filled with scrumptious goodies like soft marshmallows and crunchy walnuts. Different flavors and textures fill each square, making every bite totally irresistible! To make Nutella fudge, you only need a handful of ingredients. Chocolate chips, sweetened condensed milk, vanilla, walnuts, marshmallows — and of course, Nutella! — are all you need to make it. 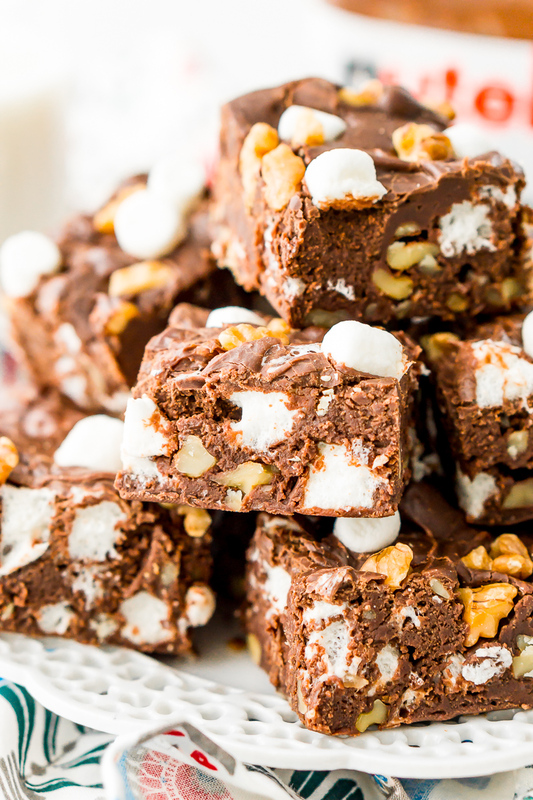 What’s more, Nutella Rocky Road Fudge only takes about 5 minutes to prepare. Just combine all the ingredients in a pot on the stovetop, stir, melt, and pour into a pan to chill. With that said, this fudge does take about 4 hours to firm up in the fridge. But you can spend that time making other recipes, cleaning, or, you know … enjoying a Netflix binge! 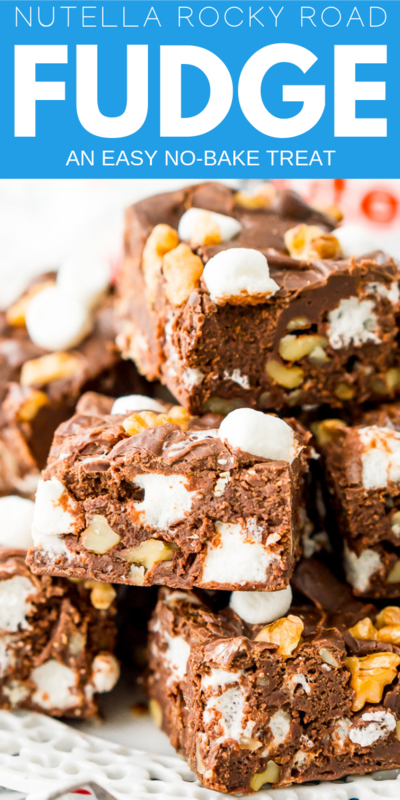 Rocky Road Fudge is the perfect recipe to make and share around the holidays. It’s also something fun to whip up when you’re hunkered down inside on a cold, snowy day. I also like bringing a batch of this stuff to share at get-togethers during the holiday season. Fudge is one of those easy-to-grab treats that people enjoy munching on, plus people of all ages love Nutella! 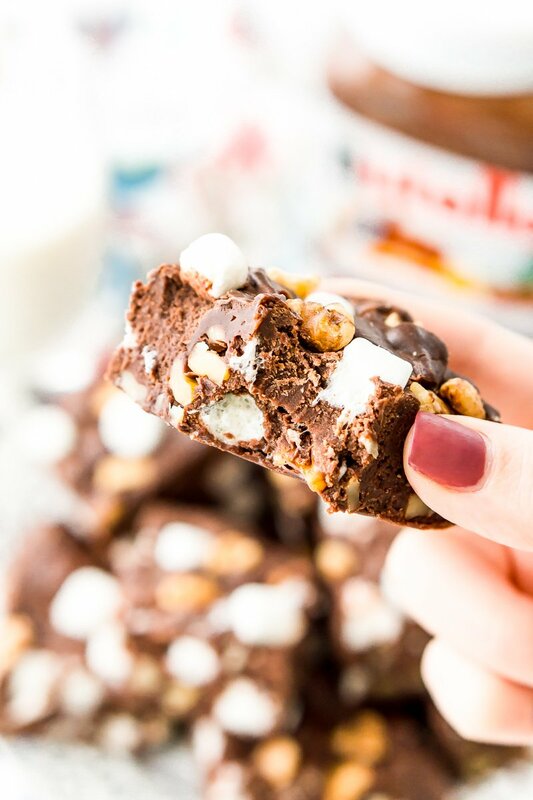 If you’re looking for a classic dessert with a crowd-pleasing twist, try this easy-to-make Nutella Rocky Road Fudge. In fact, make two batches just in case … this stuff goes fast! Line an 8x8-inch baking pan with aluminum foil and spray it all over with cooking spray. Add the chocolate chips, sweetened condensed milk, vanilla, and Nutella to a medium saucepan and cook over low heat, stirring constantly until mixture is smooth. Remove from heat and fold in most of the mini marshmallows and chopped walnuts, reserving some of each to sprinkle on the top. Pour the fudge mixture into the prepared baking pan and spread evenly. Sprinkle the remaining marshmallows and walnuts on top and gently press them into the fudge. Let the fudge sit at room temperature for 6 hours or in the refrigerator for at least 4 hours until set. Cut into 25 squares. Store fudge in an airtight container for up to two weeks. Other kinds of nuts can be used instead of walnuts. Dark or milk chocolate chips could be used instead of semi-sweet. I prefer to let sit at room temperature until set because I think the marshmallows are less gummy this way. Adapted from Wine & Glue.